To start Open Canoeing you don't need any previous experience; coaching sessions are available throughout the summer and the River Wye trip is open to first timers. Open canoeing trips are possible all year round and are more popular in the summer months when camping is more pleasant 😊. The Club also runs Bristish Canoeing 2 star courses during the summer, which teach both kayak and canoe to a standard suitable for all but the more advanced trips. 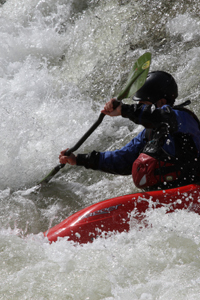 In the winter it tends to be white water day trips with paddlers running rivers up to grade 3 alongside the kayakers. Keep an eye on the calendar for events or if you just want to give it a go get in touch with the Paddlesports.